Lately I've been reminiscing (and looking back through old photos) of all the wonderful events we used to take our kids to when there were *only* four. When the big kids were all little, it was easy to go somewhere that made everybody happy, they were all at innocent ages and anything out of the ordinary was perfectly magical. 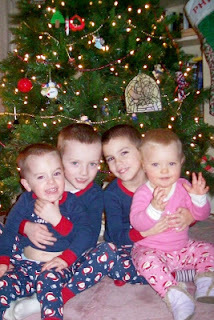 Around Christmas time, we would take them to an Enchanted Village, a breakfast with St. Nick, to see the lights at LaSalette, we would even just "kill time" before bed by driving around to look at the Christmas lights in surrounding neighborhoods. 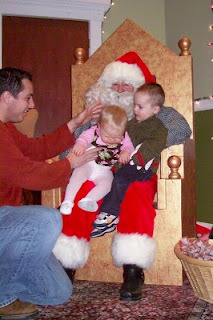 Then they grew up and got busy and it almost seems impossible now to carve out time to do these family events. Even if we could figure out some free hours, the older kids aren't as willing to drive an hour each way to see a fake santa or some lights. It really bothers me not to be able to do these things as a family anymore. I miss the days when everybody was on the same page and wanted to be with mom and dad all the time. (I don't want to idealize those days of all littles - because they were also the hardest - but the memories of these special events were so worth the trouble). The first time we had snow this winter, Declan looked out the window, wide-eyed and joyfully exclaimed "It's CHRISTMAS!!" and we all smiled at his innocence in equating snow with Christmas. It's things like that I want to make sure to encourage and enjoy with the younger set as I did with the first. I panicked today, realizing I needed to grab some items for their stockings tonight because St. Nicholas Day is tomorrow already! I know the big kids won't mind if we skip a year, but I want the little kids to embrace the tradition as their own. I'm determined to take the family to a holiday themed event, even though I know at least one older boy won't be able to make it with his work schedule. I found an event that will incorporate St. Nick, a holiday concert, and a Christmas light display. As silly as it sounds, I feel like my heart will be restless until I accomplish this goal. I'm the mom, and henceforth responsible for making sure everyone has a chance to make these memories for themselves. Like I'm somehow depriving them of their childhood if they don't see a "fake santa and lights". I know that's not true, and I know I'm just putting more pressure on myself than I should, and yet, I can't stop. When I'm more rational, I'll realize that these three younger ones have a better childhood than the first four, precisely because the same older siblings whose schedules keep us too busy are also the ones who dote on them. I do truly believe this, and being the 5th of 6 kids myself, always felt that way. It's just that a mama's heart gets a little irrational sometimes trying to make sure every little one feels as loved and cherished as the next. Time stands still for no mom, and I want to squeeze in these special memories for them while I'm still around to do it and they're still young enough to want to participate. Because, if anything, I've learned from my older ones how fleeting a childhood really is. I can appreciate this sentiment. Right now I feel it the opposite way: there are events I think my older kids (I have 5, ages 10-2) would like but would be painful to bring the two year old to (either constantly asking/yelling to get out of his stroller or running around like crazy, and he’s loud! ).